On an award season podcast one pundit said “Green Book” is likely his mom’s favorite movie of the year even though she hasn’t even heard of it yet. Accurate. The film is entertaining from start to finish with completely compelling performances from its two main actors; they create a delectable chemistry together. General audiences will eat up the film; especially those who are prone to patting themselves on the back for seeing an “important” movie that deals with serious issues like racism. 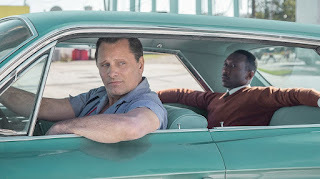 The film takes the point of view of a prejudiced white Italian-American man as he chauffeurs a distinguished black musician around for a concert tour of the segregated American South in the early 1960s. There’s comedy, there’s drama. In the end the white guy learns a valuable lesson and you leave the theater with your heart full. I felt conflicted – the movie works because of the performances and does leave you with a sense of hope but I can’t help feeling the movie is just another manipulative white savior story about how racism is bad. How Peter Farrelly, the co-director of such comedy hits as “Dumb & Dumber” and “There’s Something About Mary,” came to a story about a white and black guy becoming friends while navigating the segregated South is beyond me. The direction is fine. You can tell this is the work of a man who makes colorful, broad crowd pleasing comedies. Maybe it was the road element that attracted Farrelly to the project. Maybe he wanted to make a statement. Maybe he just wanted to try his hand at Oscar bait. But is a white guy from Rhode Island really the best choice to tell the story about how a prejudiced white guy learns to respect people of color? Farrelly is up for the challenge and he succeeds for the most part. But that sort of thing ultimately doesn’t really matter because the film that we’re given is actually a pretty enjoyable experience. And that’s because of Viggo Mortensen and Mahershala Ali. Mortensen is Frank Vallelonga a stereotypical Italian-American New Yorker with a family who works as a bouncer at the Copacabana and is looking for other work after the club is closed for repairs. He is recommended for a job as a driver for Don Shirley (Ali) a dignified pianist who is going to be taking a tour of the Deep South in the months leading up to Christmas. Don is a black man and there’s an immediate culture clash between the two men, but Don needs Frank because he’s a tough guy who doesn’t take anyone’s BS and will protect him as he enters the racially charged Southern states. Of course Frank has is own hang ups about people of color. As the film progresses we learn more about these men and how they begin to learn about each other and change for the better. Some scenes could have been a bit cringe-worthy in less capable hands like an amusing scene where Frank stops at a KFC to enjoy fried chicken and he gets Don to eat the finger food for the first time. I sort of admire how the film plays a bit with some stereotypes and sort of calls them out. Considering that the film is essentially an odd couple road trip movie, the script from Farrelly, Brian Hayes Currie and Nick Vallelonga (Franks’ real life son) is pretty strong but I sometimes wonder how the film could have been even more authentic had people of color been the ones writing and directing it. Some authenticity is lost to be honest. And the fact that one interesting aspect of Ali’s character is sort of introduced and then glossed over felt frustrating. The film feels like it’s more about a white guy learning a lesson than a historically accurate portrayal of the horrors of being a black person in the South in the 60s. But this really isn’t that movie. I also have the sneakiest suspicion that the main audience for this film will most likely skew white and older. The type of audience who doesn’t necessarily run to ethnically diverse films. The film also generally feels a tad dated with a strong “Driving Miss Daisy” vibe but I’d watch this a million times before watching that film again. And the film's technical merits are fine but nothing groundbreaking.